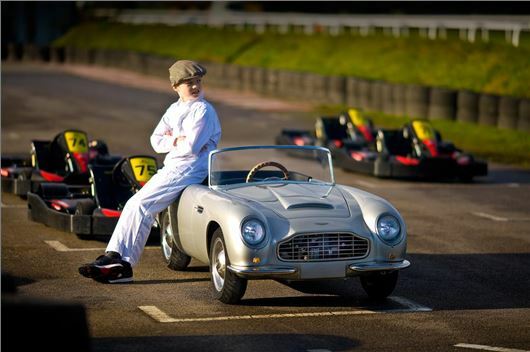 Aston Martin Heritage dealer Nicholas Mee is now selling a fully functional petrol-powered mini Aston Martin model, suitable for anyone aged 10 and up – it’ll even fit an adult. Priced from £16,5000, the shrunken replica of a 1960s DB, which is two-and-a-half metres long, is powered by a 110cc petrol engine linked to a three-speed semi-automatic transmission. It’s not just a toy – top speed is 46mph and everything works, from the headlights and indicators to the electric starter and the horn. Buyers can even be as discerning as they would be when purchasing a full-sized Aston Martin – there’s a selection of interior trims and colours that can even be matched to another car. The interior is trimmed in leather and there's even an authentic wood-rimmed steering wheel.